Overwhelming the Border Patrol with numbers, trying to force catch and release. United States Border Patrol agents arrested nearly 300 people at the New Mexico border with Mexico. The arrests happened Friday morning at the Antelope Wells port of entry in the state’s boot heel. 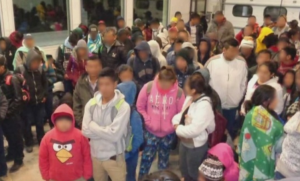 Agents found a large group of people from Guatemala, Nicaragua, El Salvador and Honduras crossing the border illegally. They also spotted a Guatemalan boy showing signs of sickness. The boy and his father were taken to a nearby hospital. In the fiscal year starting on October 1, the Customs and Border Protection has arrested over 27 groups of more than 100 individuals around the area.